The convenings of the Opportunity Youth Forum are a twice yearly highlight for members of our network. Attendance is by invitation only. 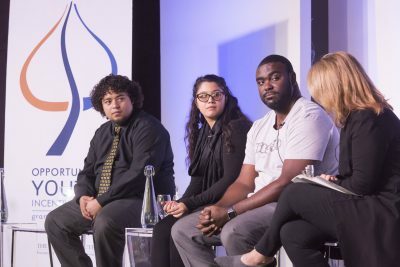 In collaboration with key implementation partner Jobs for the Future, the Opportunity Youth Forum designed and launched a national learning community of grantee partners. This learning community engages Opportunity Youth Forum site leads, youth leaders, funders, thought partners, and national leaders across many sectors in two convenings per year: a spring convening, typically hosted by a member community in order to promote learning in local context and lift up promising local practices in reconnecting opportunity youth, and a fall convening, which takes place on the Aspen Institute campus in Aspen, Colorado and focuses on national innovations and movement-building efforts. Here is a page on the the Fall 2018 Convening, which took place in Aspen, Colorado, on October 8-10, 2018. Here is a page on the Spring 2018 Convening, which took place in the Seattle/South King County area of Washington, on May 14-16, 2018. Here is a page on the Spring 2017 Convening, which took place in Boston, Massachusetts, on May 22-25, 2017. Here is a page on the Fall 2016 Convening, which took place in Aspen, Colorado, on October 3-5, 2016. Here is a page on the Spring 2016 Convening, which took place in Chicago, Illinois, on April 11-14, 2016. Here is a page on the Fall 2015 Convening, which took place in Aspen, Colorado, on October 19-21, 2015.